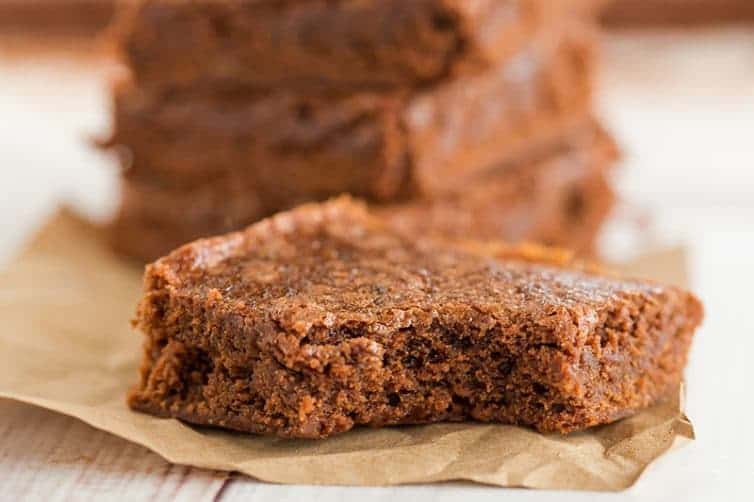 These Hershey’s best brownies are a quick and easy one-bowl brownie recipe that produces dense and fudge-like brownies. Perfect for a quick chocolate fix! Let me introduce you to the very first brownie recipe that I ever made from scratch… Hershey’s best brownies. But seriously, this recipe was just what I needed to flex a little baking muscle and gain some independence in the kitchen so that I could go on to tackle all sorts of more complicated recipes. The perfect brownie stepping stone, if you will. Once I stumbled upon Hershey’s best brownies recipe, I realized that they are the easiest possible brownie recipe that doesn’t come from a box, and you can have fresh-from-the-oven brownies ready in less than 45 minutes. I was sold, and these brownies became a regular appearance in my kitchen. 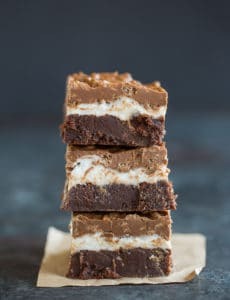 Now, these bake up a bit on the thin side, so if you prefer your brownies a little thicker, feel free to use an 8-inch square pan instead of the 9-inch, and bump up the baking time by a few minutes. If you need a super simple, one-bowl, one-spoon brownie recipe, look no further! 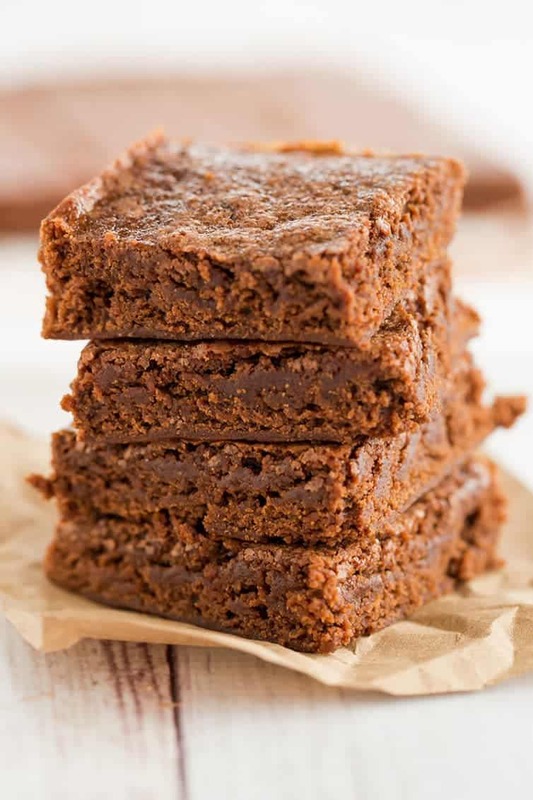 A quick and easy one-bowl recipe that produces dense and fudge-like brownies. Preheat oven to 350 degrees F. Grease a 9-inch square baking pan and line with parchment paper or foil (for easy removal, if desired). In a medium bowl, stir together the butter, sugar and vanilla with a wooden spoon. Add the eggs and beat well with the spoon. Add the flour, cocoa powder, baking powder and salt and stir gently until well blended. Stir in the nuts, if using. Spread the batter evenly into the prepared pan. 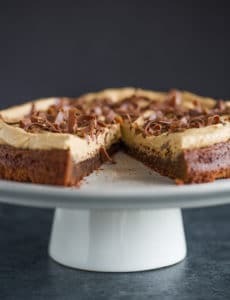 Bake for 20 to 25 minutes, or until brownies begin to pull away from sides of the pan and a toothpick inserted in the center comes out with moist crumbs attached. Cool completely in the a pan on wire rack. Cut into squares and serve. 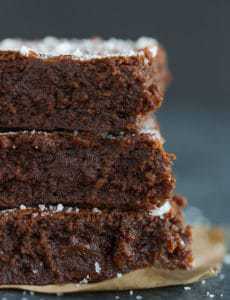 (If you used parchment paper or foil, use that to lift the brownies out and cut on a cutting board.) The brownies can be stored in an airtight container at room temperature for up to 4 days. 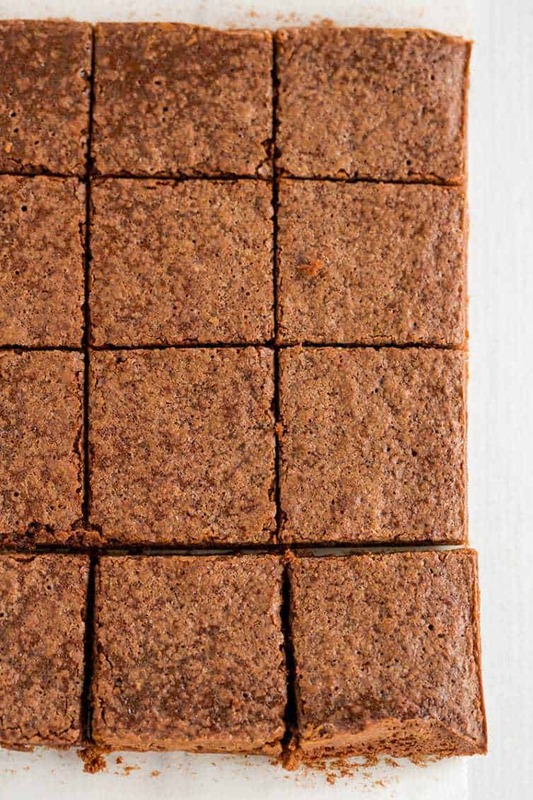 These brownies are on the thin side; if you like thicker brownies, bake them in an 8x8-inch square pan and increase the baking time by a couple of minutes. I tried the Hershey’s recipe today as is and thought they were good, but would prefer to make them less sweet next time. Would you be able to tell me if I could reduce the sugar without making the brownies bitter? Or should I increase the cocoa powder instead? I appreciate the advice! I made these today and the only slight change was 120grams of caster sugar with 78 grams of light brown sugar, I also added 50g of chocolate chips and 50g of crispu M&M’s, I baked them in an 8″ square pan, in a 160C fan oven (UK) for 22 minutes. They turned out amazing! Any idea what would be different if I’d used granulated sugar instead? This is only the second thing I’ve baked for at least 25 years and I will definitely be doing them again…maybe tomorrow! I never use all-purpose flour. I always use self-rising. I wonder why all recipes call for all-purpose and does it really make a difference? Hi Linda, It definitely makes a difference. Self-rising flour contains leavening agents, while all-purpose flour does not. You should not substitute one for the other. Wondering if these would translate well making them in a mini muffin pan as “brownie bites” how long would it take to bake? Hi Betty, I’ve never made brownie bites, but I image the recipe would be fine for doing so. As for how long to bake, I’m not sure, maybe start checking around 8 or 10 minutes? Love this recipe. Have made it several times within the last month. It is a huge hit with the hubby and kids. Thanks for sharing. My batter came out liquids, not thick, like the first time I made them. The brownies came out okay in the end, though, but just ok. Same! How do u fix that? Luuuuuuv the brownies! I am definitely going to make another batch for thanksgiving! Although, I did need to use two batches for one pan…. Maybe because my pans pretty big. HI! So… Heres my thing….. I am a bit young…. I am a rookie baker I guess, and I am in the eight grade. You see, every week at school is such a drag for me, whenever I come back from school on Friday, I want to bake…. Something to mooch on on Saturday morning with milk or something….. I hope you know what I mean so far…. You see, in different cultures, there are different foods like Asian food Is spicy, Mexican food almost always includes beans Italian foods main ingredient is cheese…. I am Asian…. So, i hope you get what I mean when I tell you that it was REALLY HARD to find vanilla extract or cocoa powder aroun here because my mom does not use that stuff in her kitchen….. Now um… Most recipes need baking powder and we do not have that at all in my house… And I need to know if baking powder is always needed or if it can be skipped…. Substituted….??? Thnx SOOOOO MUCH!!!! Well, the short answer to your question is that while baking powder is required in every single recipe, you do need to use it whenever it is called for. It’s a leavening agent, which means that baked goods that call for it won’t rise without it. I would ask your mom to purchase baking powder and cocoa powder if there are recipes you are interested in making that need it. Thanks so much! I asked my mom to get baking powder, we made the brownies, ad my mom loved them so much, she said she would pay me to make more batches to have at thanksgiving dinner! Best brownies ever. Made them last night, with little bits of dark chocolate chopped up and thrown in, AMAZING. First homemade recipe I prefer to boxed. Thanks for sharing this! It really depends on the specific recipe, but the biggest thing is not to overbake them. You want to take them out when there are still some wet crumbs left on a toothpick inserted in the center. Good luck! For some reason when I did this one the brownie didn’t pull away from the edges. Try the Barefoot Contess’a brownie recipe. It can rival any brownie recipe out there. It is the best!! I am SOOOOO sorry,…. Beth??? I thnk…. But I am not answering ur question, I have one of my own…..so here it is…. HI BROWN EYED BAKER!!!! I LUUUUUUV UR WEBSITE!!!! I USE IT ALL THE TIME!!! This question is for U.
I am trying to make these brownies and I am not really sure I have baking powder…. IS BAKING POWDER A NECCESARY INGREDIENT?? Thnx….. PLEASE ANSWER ASAP….. ANYONE…. -A baker that seriously needs the answer to the question above. Yes, you definitely need to use baking powder. i am going to make these tonight, maybe i’ll post a pick and link to your post, is that ok? i loooove brownies, and cookies, would you by any chance have brilliant basic cookie dough recipe too? i am going to be soo OD’d on chocolate! hehe!! I am going to have to give these a try. I don’t make brownies often but I should because they are so good.